Here’s a photo of the cottages in Lake Place, taken earlier today. 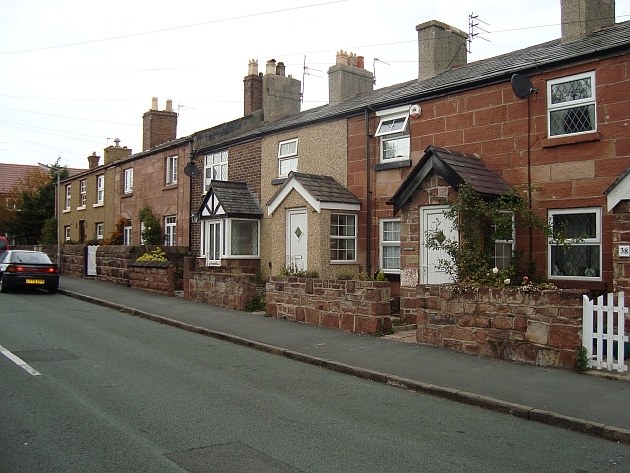 A few years ago some of these cottages were in quite a sorry state of repair but now they look like cared-for homes. I think that these properties used be homes for local fisherman and they must be getting on for being some of the oldest properties in Hoylake. In the middle – and out of shot – is The Lake pub, followed about three more cottages. I’m led to believe that the right end cottage, again out of shot, used to be a pub many years ago called the Pig And Whistle. I know this because back in about 1991 the property was for sale and I looked at the particulars. The property did have a cellar at that point in time where the casks of ale where kept. Can anyone offer any more details about the Pig And Whistle …feel free to leave a comment! There was supposed to have been a pub at the corner of Marmion Road and Strand Road, was this the Pig and Whistle? The cellar is still visible at the side where the barrels went down. We nearly bought it in 1979 but there was too much work to be done and we did not have the time. The cottage on the corner of Grove Road and Lake Place (the prom side) was the original pub known as the Pear or Cherry Tree Inn I think. It was owned at one time by an aunt of Beryl Alsop whose daughter Sue owns Sue’s Florist on Market Street so you might get some further info. from there. My granddad – Robert Stephenson – was born in the cottage directly to the left of the Lake pub in 1897 (I think the year was). My mum – Jean Stephenson – was born in the same house in 1940 as was her brother, Bob, a few years before her. I remember visiting my grandad at his home and his back room included a black wall range which was very warm and most impressive. He had an outside loo in the back yard which had the big parish hall at the back over the alley way. My granddad was a fabulous painter and painted many oil paintings – one depicts the cottages down Lake Place and was painted in the 50s or 60s. Another he painted was of Market Street some years ago – again I think in the 50s or 60s (he died in 1984). His pictures were Lowry-esqe and as a child I was fascinated by his artwork which adorned his walls in his front sitting room in Lake Place. These pictures now have pride of place in my home in Northampton! Lovely memories! Yes she does. She has been there for 32 years! Ah! That’s rather interesting – many thanks for leaving the comment. I don’t know fow many people know it but, in 1690 Hoylake had ‘two houses and the King’s Store House’. This was recorded by King William III chronicler but in the 1751 census Hoylake was reported to have 150 houses, a vicarage and two ‘hotels’ the Lake in Lake Place and the Plasterers Arms off Grove Road where the landlord was Mr George Washington. The census also recorded that a 3rd hotel was being built on Main Street namely the Ship Inn which was built as a coaching inn. A writer at that time recorded that there was not a house in Hoylake where you not avail of a good glass of French Brandy, Holland Gin or West Indies Rum, including the vicarage. Some of you may remember Joe and Nell Tottey who lived in the first house off Lake place. I remember them from the Plasterers Arms, they used to come in to the snug and if anybody was sitting in what they considered to be their seat would stand in front of them not saying anything. The ‘squatters’ would soon got the message and moved allowing the couple to sit in their normal place. There was also a seat where nobody wanted to sit, that was where Betty the Landlady in the 70’s used to sit. Not saying the reason for this but can tell you that it did pong! I have found the Eccles and Hughes fisherfolk in my family tree. John and Elizabeth Eccles lived at 18 Lake Place until they were departed by death in their 90’s….1841-1871 census. Great to see the cottages have been given a new lease of life. Hi I visited Lake place on Sunday and saw Elm Cottage in Lake place , am I right in thinking this is where my relatives lived in 1890s? Hughes and Hazelhurst? Their address was Elm Cottage off Market Street, had a beer in Lake Inn amazing to think my relatives also probably sat in there! The cottage at the corner of Grove Rd and Lake Place (prom side) was owned by Bill and Ethel Smith (nee Stanley). Ethel I think outlived her husband and lived there until late 80s early 90s until her death? Don’t know about the Pig and Whislte Pub, but I had relatives who may have lived in those cottages in the 1860’s. Sherlock’s & Fulton’s who were fisherman and John Hayes who was a Coastguard there in the same time.They lived at number 6 & 11. I only live in Wallasey and with doing family research I should go there. Hi re Elm Cottage, I have relatives who got married 21st Nov 1891 and they give address as Elm Cottage, off Market Street Hoylake. They were George Hughes and Sarah Jane Hazlehurst. Nice to hear from you …yes you should pop along one day and take a look. May go wednesday. Are 6 11 and 16 still there? Hi Mike, just come across your post (almost a year later). I am interested to know if number 16 Lake Place still stands as according to the details on the marriage certificate, my paternal grandmother lived there until her marriage. Her maiden name was Chilton. Her father’s name was John W. (? ), – he is listed as deceased at the time of her marriage. HIs occupation was listed as Theatrical Business Manager, whatever that is … perhaps he frequented the Pig & Whistle! I do not have any information on her mother, at this point. Would be lovely if I could attach photos circa that period. Thanks and regards, Rosie (Australia). Have been to Lake place at last and said cottages of my ancestors are still there. I have takenm some photos as a reminder.